After a massive tornado killed their children in their elementary school, grieving Oklahoma parents are joining forces to build twister-proof shelters in every school in the state. 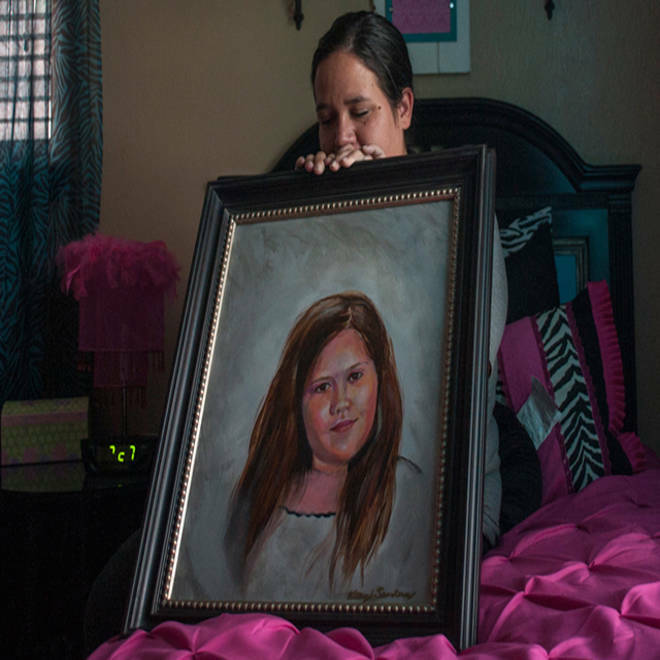 MOORE, Okla. — Parents of the seven Oklahoma boys and girls killed when a massive tornado struck their elementary school are joining forces to help prevent other families from suffering such an unimaginable loss. Their goal: To build twister-proof shelters in every school in the state. "Our children are not going to die in vain," said Stacey McCabe, 50, whose son Nicolas, 8, was killed with six classmates at Plaza Towers Elementary School. "I will not let that happen, and I will not let this happen again to another parent." Like most other schools in the state, Plaza Towers had no safe room where students could escape the wrath of the mile-wide tornado that brought devastation over much of this Oklahoma City suburb on May 20, leaving 25 dead. Debate over whether such shelters are necessary, and expense and bureaucracy have kept safe rooms from being retrofitted into older buildings. Next week, McCabe and parents of the other children killed at Plaza Towers will announce they are partnering with Shelter Oklahoma Schools [S.O.S. ], a nonprofit started by a local attorney, to raise enough money to help build underground shelters or above-ground safe rooms in all of the state’s nearly 1,800 schools. Relatives of the seven schoolchildren who died in Moore, Okla. after a tornado hit their elementary school are pushing for storm shelters for every school in the state. NBC's Gabe Gutierrez reports. "Our children should be safe. We assumed they were,” said Scott McCabe, 52, struggling for words in his first interview since the death of Nicolas, his only child. Oklahoma, like almost every other state in Tornado Alley, does not require shelters in schools (only Alabama requires storm protection, and only for new buildings). Few schools have built safe rooms on their own. One reason: Tornados typically occur after school, so the deadly storm that struck here on a spring afternoon is considered rare, said Ernst Kiesling, executive director of the National Storm Shelter Association. The structures can be costly, too, with estimates ranging from $200,000 to more than $1 million. Although the Federal Emergency Management Agency helps fund safe rooms for residences, city officials in Moore complained earlier this year about changing requirements and a lack of funding for the program. School districts that want to build shelters can raise money locally through bonds or can apply for funding via FEMA’s Hazard Mitigation Grant Program, either on their own or as part of a city or county application. That program had recently run low on funds because the monies for it come from disaster declarations, and there hadn't recently been many until the May 20 tornado, said Keli Cain, a spokeswoman for the state’s Department of Emergency Management. That echoed what the city of Moore said was its “main obstacle” to moving forward with the initiative: funding. The state does not offer schools money to build safe rooms. But in the wake of the May tornado, Oklahoma officials are working with FEMA to identify new funds — private sector partnerships, individual donations, federal grants — to help subsidize the costs, Cain said. Scott McCabe consoles his wife, Stacey as they stand remembering their son, Nicolas McCabe, 8, in their backyard, near the field where he would ride his go-kart in Moore, Okla.
“We want to see safe rooms, but it’s definitely not something that can be accomplished in a year or two,” she said, noting cost was the biggest hurdle, as well as setting up a program that would pool money from various sources and would require creating an application process. FEMA spokesman Dan Watson said the agency was working with Oklahoma officials to determine cost-effective methods of retrofitting existing schools with safe rooms. He also noted that the agency has invested more than $57 million in 11,000-plus shelters in public and private buildings throughout Oklahoma – more than any other state. It’s not clear exactly how many schools lack storm shelters: About 85 of the state’s nearly 1,800 schools have FEMA-funded safe rooms, Cain said, and the state education department said an informal survey conducted after the disaster revealed that about 430 have safe rooms, while 237 others have cellars/basements. The cost to equip all schools could run upward of $1 billion, said John Hunt, the attorney in nearby Norman who started S.O.S., which is administered by the nonprofit Oklahoma City Community Foundation. But Hunt said regardless of cost, every child, teacher and school staffer deserved shelter. The group hopes to start construction work in 2014. 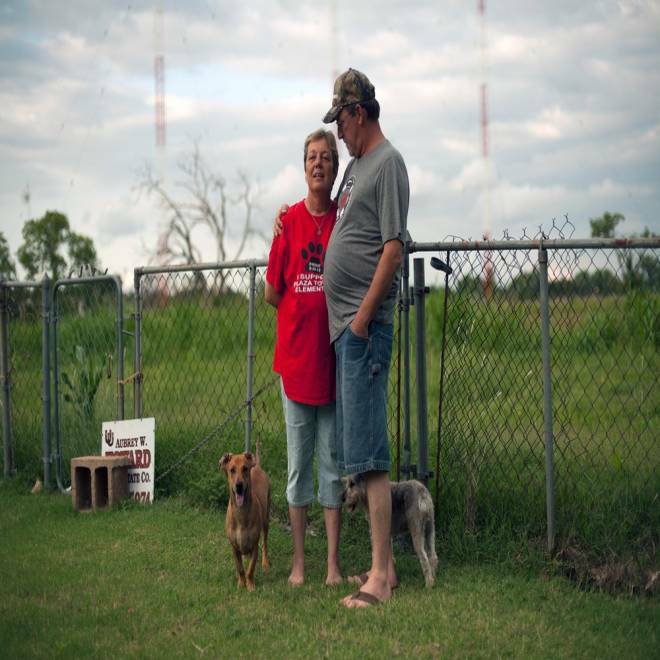 "It’s truthfully not a matter of if tornadoes hit you in Oklahoma. It is a matter of when,” said the Oklahoma native. “That is just our reality." So far, S.O.S. has raised more than $2 million in donations. “I don’t know if we will get there,” Hunt said of the goal. “But I know what will happen if we do nothing: We'll never get there." The parents of the Plaza Towers victims plan to help raise more money and are passionate about the work ahead, no matter how daunting. 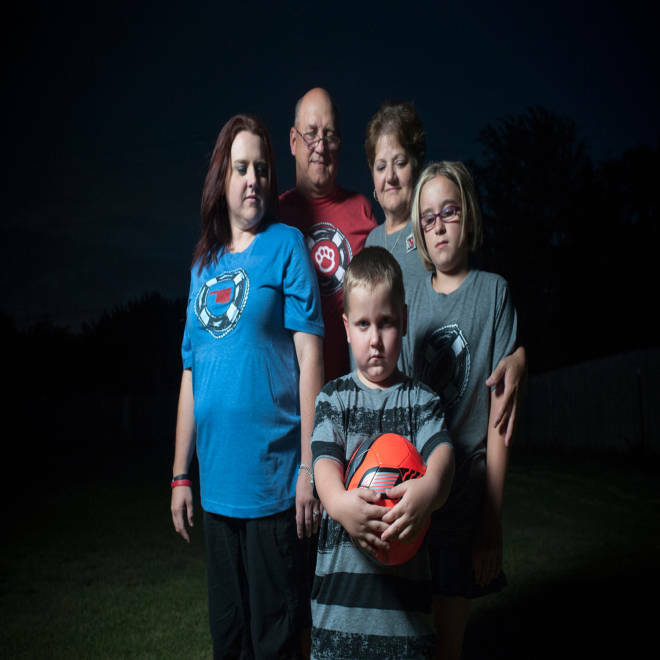 Mikki Davis (far left) stands for a portrait with her parents, Terry and Sharon Davis, her daughter, Kaylee, and her stepson, Ty Cole, who holds her son Kyle Davis' soccer ball at her home in Noble, Okla. Kyle, 8, who loved soccer, was one of the seven children killed when the May 20 tornado struck Plaza Towers Elementary School. "I can’t bring Kyle back,” Mikki Davis said of her son, 8, who died at Plaza Towers. “But if his life was taken so that others can be saved in the future because we did something about it, then that makes me proud to be his mom." "You shouldn’t have to go through rubble looking for your kids,” she added. That was what the parents and first responders had to comb through after the powerful tornado, churning at more than 200 mph, made a direct hit on the cinderblock Plaza Towers building about 30 minutes before the end of the school day. The twister ripped off the roof, sending walls crashing down and deadly debris flying. Some teachers had shuttled students into bathrooms to find a safer spot in the nearly 60-year-old building, while other educators lay over children to protect them. Parents rushed to the school, some walking miles through rain and scattered debris. Davis fell ill and was taken to the hospital. Other parents waited into the night at the site for word of their child's fate. “It’s crushing. It’s a complete loss,” Dan Angle said of losing his daughter, Sydney, 9, at Plaza Towers. “Imagine looking forward to the rest of your life knowing that you don’t ever get to be truly happy ever again … being truly happy is a thing of the past." The initial bonds between these parents were forged on that tragic day. Two families, the McCabes and Conatzers, who lost their 9-year-old daughter, Emily, were informed of their children’s deaths together. Since June, when the parents started planning their efforts with S.O.S., they have learned about each other’s kids and have shared birthday commemorations for their children, releasing balloons in a cemetery where three of the youngsters are nestled side-by-side and another rests nearby. The S.O.S. mission has given the grieving Plaza Towers parents some comfort and a shared goal during the dark times when they have longed to hear their child’s voice or take them back-to-school shopping. For the McCabes, S.O.S. has helped them to keep focus. Scott often stands at the end of his driveway to talk to his deceased son in order to help him “get through the day,” while Stacey said the “quietness” at home was unbearable. The couple have contemplated moving. "It’s being able to get with the other parents ... and just keep going,” said Stacey, who has stocked their garage with S.O.S. T-shirts and is focused on an upcoming fundraising run. “We’re all pulling together to support each other." "It’s hard because when we’re all together, we’re usually crying,” said Kristi Conatzer, mother of Emily. “But we can do that together. It’s a healing process." 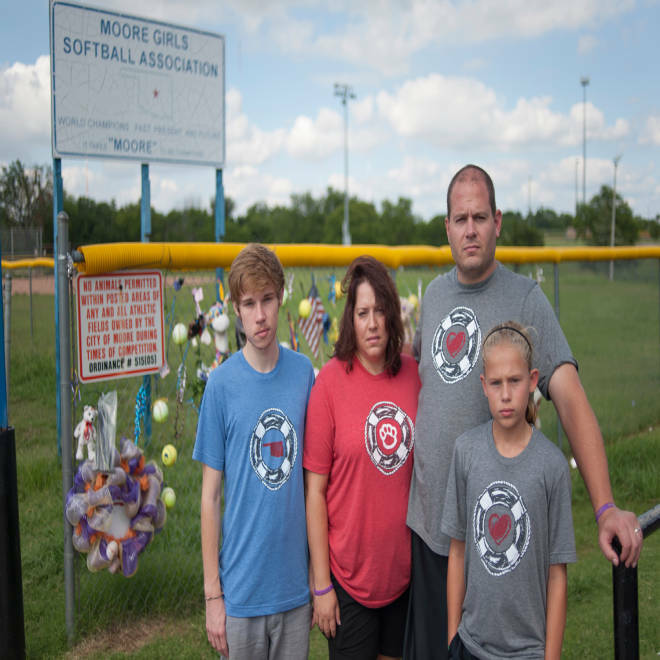 Dan Angle and his wife, Nicole, stand with their children, Casey, 11, (right) and Jory, 17, (left) in front of memorabilia that has been hung on the outfield fence of a softball field at Buck Thomas Park in Moore, Okla. The Angles' youngest child, Sydney, died in the May 20 tornado. The Conatzers, who also lost their home in the tornado’s destruction, recently moved into a new one and installed a miniature “fairy door” at the front entrance — something Emily always wanted. But the home is missing her bed, her backpack and her voice. Conatzer said it was unacceptable that the district did not do the shelter work beginning in 1999, after two schools in Moore were hit by a tornado of the same intensity as the one that struck this year. No one was injured, but an elementary school was leveled. The sites were rebuilt with shelters. "Our house was replaceable, but our daughter is not,” Conatzer said. When she and the other parents officially join S.O.S. at a public event on Aug. 20, Conatzer wants to tell officials who could help get shelters built to “have to walk a day with the guilt of leaving your kid at school thinking that they’re OK."
"That’s the biggest problem,” her husband Chris, 34, said, “knowing that you had enough time to go get them. We did. We had enough time. But no, we thought the school was safe." Their youngest daughter, Luci, will return to school this Friday at Plaza Towers’ temporary site – which doesn’t have a safe room, either. But Moore Public Schools Superintendent Robert Romines said that when new school buildings are built to replace Plaza Towers and the nearby, flattened Briarwood Elementary, both sites will have storm shelters. Ground will be broken for construction on those buildings in a few weeks. However, 28 schools in the district remain without shelters. To that end, the city of Moore said a committee was reviewing storm shelter requirements for schools, among other sites, and was collecting information on building techniques and costs. The committee intends to have a draft ordinance for the mayor and city council to consider by year’s end, Elizabeth Jones, Moore’s community development director, said in an e-mail. 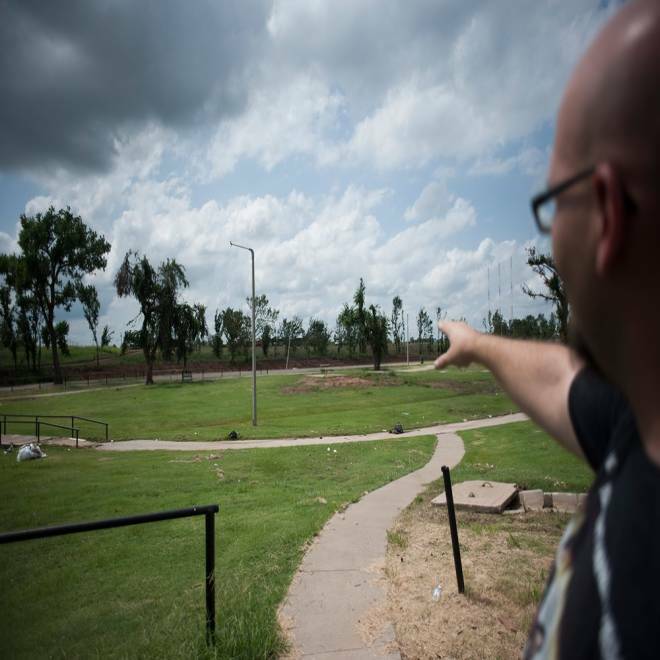 Chris Conatzer points to the park that he and his daughter, Emily, 9, would walk in near their home in Moore, Okla. Emily was one of the seven children killed when the May 20 tornado struck Plaza Towers Elementary School. While Kristi Conatzer finds comfort knowing that Plaza Tower kids will get a safe room in their new school building, which should be ready by fall 2014, much work remains. She said she visits Emily’s gravesite to keep her daughter posted on her work with S.O.S. "I just tell her all the time when I’m out there. I hope that she is proud of what we’re trying to accomplish with this,” she said. “This shouldn’t have happened. … But we can change the future." Scrap metal, TVs, love seats: 17 alleged looters nabbed in tornado-hit Moore, Okla.